LCD Price Fixing Class Action Settlement, in the sum of $1.1 Billion is the largest such antitrust class action recovery every obtained for consumers. said Co-Lead Class Counsel, Francis O. Scarpulla. If you bought a a laptop, monitor or television that uses LCD flat panel screen, and did that between 1999 and 2006, live in the District of Columbia or any of the other 24 states*, you could be able to file a claim and get cash in amount $25, $100, $200 or even more. 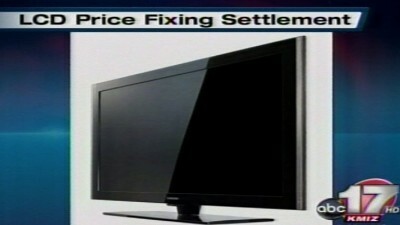 For more information about the settlement and for filing a claim, visit lcdclass.com or call 1-855-225-1886. The deadline for filing the claims is December 6, 2012. * The states eligible are Arizona, Arkansas, California, Florida, Hawaii, Iowa, Kansas, Maine, Massachusetts, Michigan, Minnesota, Mississippi, Missouri, Nevada, New Mexico, New York, North Carolina, North Dakota, Rhode Island, South Dakota, Tennessee, Vermont, Wisconsin, West Virginia, And District of Columbia.